2) First dry roast the coriander seed and then roast the fennel seeds in a pan. The two should not be roasted together as they do not roast uniformly. 2) Add the Panch Phoran (five spice mix) to the oil and when it starts crackling, add the chicken pieces and cook in the Oil for 5 mins. Mix Turmeric and salt and cover the dish and cook the chicken till tender. Check the chicken from time to time to ensure that all the water dries up and the dish does not get burnt. 3) Once the chicken is cooked, gradually add the dry spices mix (coriander, fennel, chilli,dry mango powder) to the chicken and keep stirring. Keep the fire on very low flame and cook for 2 mins. The Masalas should be properly coated on all the chicken pieces. 5) Let the pickle cool down and then store in air tight container and put it in the refrigerator. The pickle can last for upto 3 months. The Vinegar and Oil help to preserve it . However, if you are like our family, expect it to last only a week because there is nothing left after that to preserve…. Happy cooking !!! Note : The same recipe can be used to make Pork Pickle. The Pork has to be boiled and cut into cubes unlike chicken which does not have to be boiled. 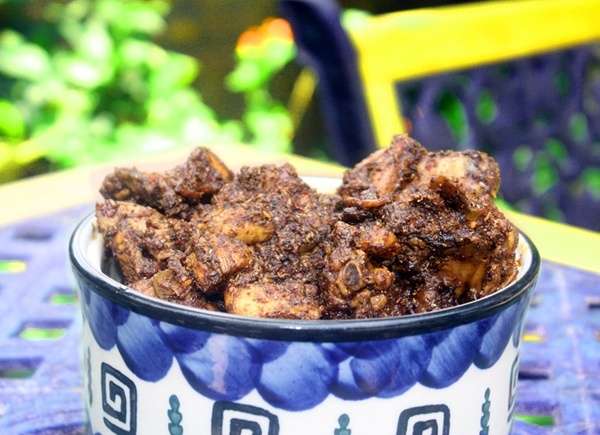 This entry was posted in Chicken, Grand Ma's Recipes, Nepali Food Recipes, Pickles & Chutneys and tagged Chicken Pickle, Kukhura ko achar, Nepali Cuisine, Nepali Recipes by Kamakshi. Bookmark the permalink. I will try this myself and let you know how it was.Thanks for this and please convey my love and regards to granny. Thanks Rajesh for visiting this site and liking the recipe. Will convey your love and regards to Granny …. Happy Cooking ! Tried this and it was easy to make as well as VERY tasty…..
What would be the best substitute for mango/lapsi powder in this recipe? In case you cannot get Amchur ( dry mango powder) then the substitute is Lapsi Powder which is commonly found in Nepal. In case you don’t get both, then you can still go ahead and make it with just vinegar added to it. The dry mango powder /lapsi gives a nice kind of sour taste to the pickle but it you don’t have it, the pickle will still taste good even without it . But in this case, don’t omit the vinegar, which is mandatory in such a case. Tried it without the mango/lapsi powder and was tasty. It would have better if I could have all the ingredients as per the recipe. Madam/ Sir plz let me that can I store the pickle outside in a air tight container..